I've been reading for quite a while, have the book and grew my first garden this summer - my husband laughs at me when I tell him "look at all my 'FREE' veggies!" Well, they'll be free in about 2 years anyway, LOL! I'm in the foothills/mountains outside of Fresno and am guessing 9B. We can get snow, but not more than a couple inches every few years and most nights don't get much below the high 20s. I am attempting to garden this winter using raised (24") table 4x4 squares that are 10" deep and are topped with greenhouse toppers I bought from Hayneedle (I can't post a link yet since I'm a newbie). I'll try to figure out how to post pictures in a bit. I just wanted to pop in and say hello to those in my region. My issues are intense heat in the summer, most of our days last summer were over 100. I have automatic watering set up so that helped a lot. I'm thinking of changing my plastic tops out for shade cloth for some of my beds so that less heat tolerant plants might work better in them. Where my garden is set is constant sun all day. Thanks for all you've taught me already - even though you didin't know you were talking to a lurker ;-)! My large garden was my starter and created before getting Mel's book so it doesn't have Mel's Mix and is 5 x 10. I will amend the soil this spring, it drains too quickly and is made from soil bought from a commercial nursery as their commercial potting mix so I have no idea what's actually in it. Things did grow well, so I'll tinker with the soil and bring it up to snuff over the next couple of years. These are my raised beds to keep out the vols and my cats (had a terrible issue with them last year) We also have rabbits around though because of my big dog I didn't have any issues last year. Here's peeking into one of the boxes. I transplanted everything that had survived our first hard frost last month. We're supposed to frost next week, so I'm looking into lights to keep the temps up. Anyone have any suggestions? Last year one of our members made a series of videos about season extending using Christmas Lights. Staf4 made at least three videos showing his set up and how he used the lights and what kind of temps he was able to maintain. Look in the Middle South Forum page 2 and look for Staf4 making hoop house video. Here is Staf74's bed in January. He did a video for it and some pictures and tips for the temp control. What was the cost on your greenhouse bed covers? I haven't seen those before. 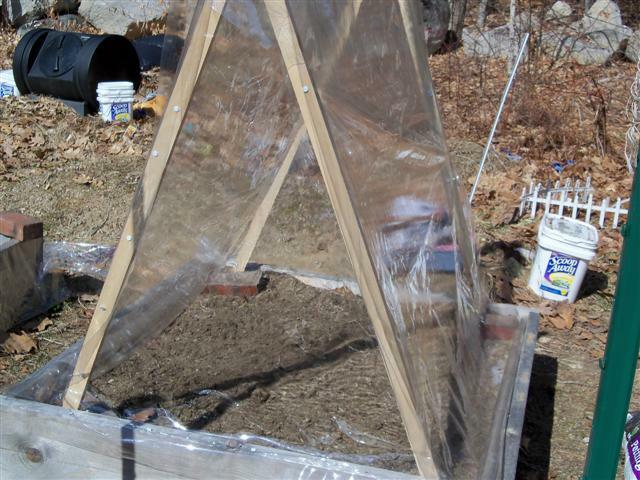 You might want to check out this thread on heated hoop houses using heating cables. I bought them for a little over $60 at Hayneedle. I can't post an active link since I'm new. 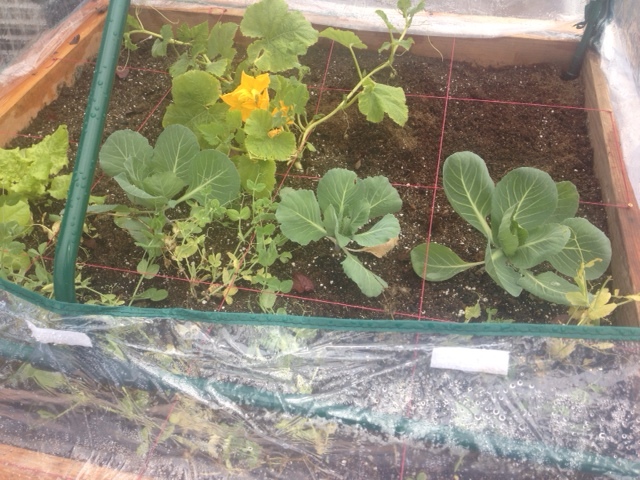 It's made by Frame-it-all, if you look under greenhouse covers you'll find them. They're nicely made, heavy gauge plastic with zippers, ties and venting windows. We'll see how durable they are over time, but the set up quickly and will come down as easily later on. I think I read through that thread but must have missed the heating cable information, I'll go back and read again. Thanks for pointing me in the right direction and all the help - much apprectiated! More than likely the commercial potting mix is mostly peat or sphagnum moss and has chemical nutrients and minerals added to it. There is probably no 'soil' or dirt in it. But you can ask at the nursery you bought it from to get their ingredient list. I say it is a good start. I would suggest you now start collecting at least 5 (or more) different types of composts that do not have peat in them and add that in the spring before planting the bed anew. @audrey.jeanne.roberts wrote: We're supposed to frost next week, so I'm looking into lights to keep the temps up. Anyone have any suggestions? A frost and a freeze are two different weather conditions. your beautiful bed covers will do just fine with offering protection from frost. A freeze is when the temperatures drop below 32*F for a sustained amount of time. You mentioned that you rarely have many days of freezing so you could go with lights or put into the bed under the cover mass that will retain heat for over nights, like plastic milk jugs filled with water and painted black. Those will attract heat during the day from the sun and will slowly release the heat over night, preventing freezing. there are a few threads about this that you can find using the search feature at the bottom of the latest topics list on the left of your screen. Hi and welcome to the forum (officially ). I am not in your region but I love drooling over pics of you lucky year round gardeners! I love your setup! Welcome Audrey! Oh I am drooling also, lol! What a setup and so well done! See by posting your pics you gave us people that are in Winter something to enjoy while we are huddled in our homes! I am sure there are others also who have ideas and pictures that they can share. I learn so much by people posting their ideas, websites, pictures, etc. It's fun to see the simple ideas that work and the fancier ideas that work! Camp that is a great idea of painting a milk jug black to absorb the heat of the day. It made me think that if I were trying to get a jump on Spring and the days were cloudy, I could fill the jugs up with very warm water. I am enjoying thinking of planting and growing when I should be out shoveling snow! Can you say procrastination!!! I like those framed greenhouses and they look so easy to put up. I'm almost tempted to get one to try it. I made my own A-frame like a teepee with posts and vinyl plastic and a few screws with binder clips to hold the plastic flaps up out of the way when working inside. Much cheaper, but I like the look of yours and those zippered openings are nice to have with netting windows to keep out bugs when it warms up. This is my invention, very raw and simple. I like yours better. Thank you Cheyenne & Tricia! I actually found the green house toppers first and had my sweet hubby build the boxes to fit them. We live in the mountains and it's a 50 mile trip one way for groceries so I really wanted to be able to grow my salad greens to save on the trips down the hill. I remembered watching Square Foot Gardening on PBS when I was a young mom. I didn't have the time, money or the need to grow things then since I could walk to the grocery store. But when I finally decided to learn how to grow food, I came here to read and bought the book and have been slowly learning what I need to know. The wood for the boxes were "free" in that it was left in the barn of two houses back and we've been carrying it from house to house because I KNEW I'd do something with it some day, LOL! So far I'm loving how easy the covers are to zip up at night and open in the morning. We had draped things before, kind of like your teepees Quiltbea only not nearly so nice or orderly, LOL! And I had everything in single pots so every one had to be wrapped. Too much work and not very effective. Yup..there definitely should be a sfg anonymous! hello everyone, i was thinking about using those clip lights with the adjustable neck, just clip them on the side and bend them away from the plastic so it doesn't melt threw the plastic. last time i priced them they were 6 or 7 dollars and you can use up to a 60 watt bulb in them and depending on the temp, there cheap enough that you could just add more as needed. @oldgrayfox wrote: hello everyone, i was thinking about using those clip lights with the adjustable neck, just clip them on the side and bend them away from the plastic so it doesn't melt threw the plastic. last time i priced them they were 6 or 7 dollars and you can use up to a 60 watt bulb in them and depending on the temp, there cheap enough that you could just add more as needed. If not, my plum tomatoes are just ripening another harvest now - I can send you some, LOL! You can see the plants in the back of the large box. I thought I would post my experience so far this winter with my mini green houses. They do pretty well down into the low 30s with each one having a string of 175 watt old style christmas lights. when it's going to be colder (which we've had a LOT of this winter) we cover all three units with an old silver heavy gauge tarp which we clip and fasten to the units with large spring clips. 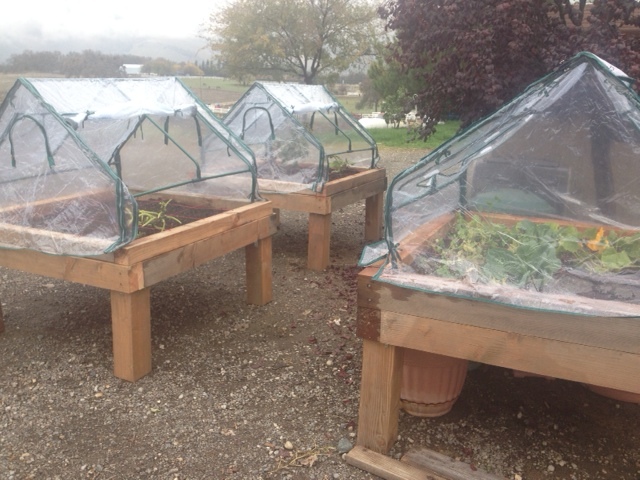 There isn't as much air space above the units as with a hoop house, but it holds the heat in quite well. 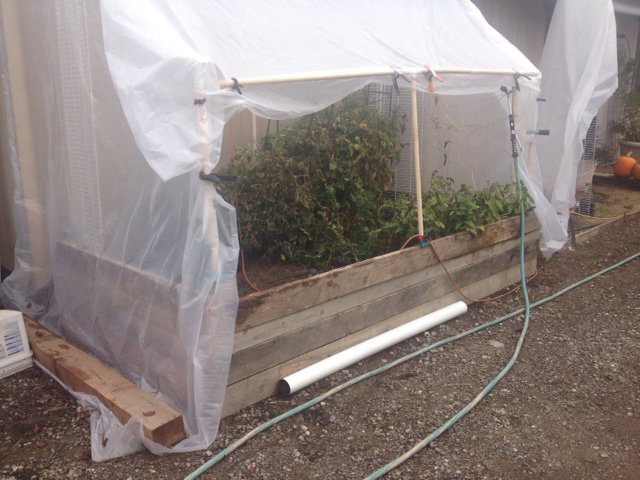 When temps dropped to the very low 20s we ran a small electrical heater under the tarp tent instead of the lights and everything came through well, including our tomato that was in there. Next season I intend to probably only grow in the greenhouse for the winter. I want to try to harvest things grown in late summer and early fall and then plant my lettuce, spinach and other greens for the winter that don't need much coddling. The large greenhouse structure kept our tomatoes growing until mid January. We used two 150 watt halogen garage light type fixtures in there. I have seedlings starting in there now and they're getting a good start.